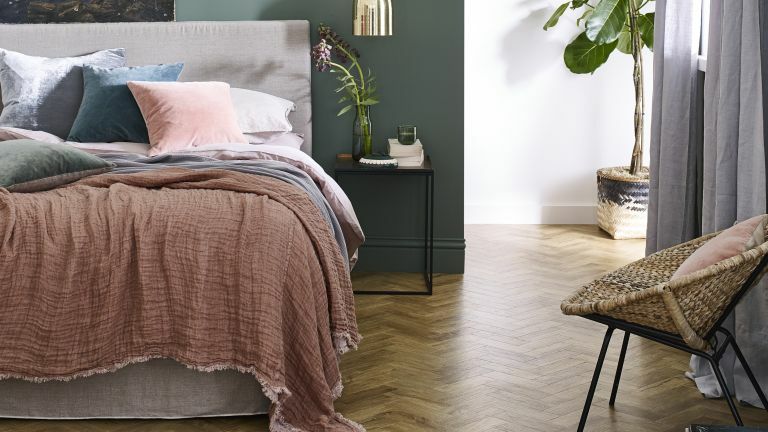 Small bedrooms are a reality for many of us – but designing your bedroom needn't be a drawback: they can look beautiful, whether you work to stretch your space with colour and storage tricks, or decorate and furnish it to make it feel cosy, comfortable, and positively irresistible. Whichever route you take, follow our guide to decorating a small bedroom and get the space of your dreams. And if after all of our amazing ideas you want more inspiration, go and check out our guide to designing a bedroom, and find more of our gorgeous bedroom design ideas that can for sure be applied to small spaces. Full disclosure: if you follow all of our small bedroom design ideas, you may not want to get out of bed at all. Changing up the colour of your bedroom can make a big difference to its perceived size, and going for a pale colour scheme in a light-starved space will make it look instantly larger. Consider going for light-coloured bedroom flooring, too, to complete the airy look. 'The cool, calm Scandinavian-styled interior isn’t going anywhere. White can open up even the smallest of spaces and combines easily with existing decoration. When used in the bedroom, it’ll help you take a step back from your busy schedule. Use white as an accent wall and pair with fashionable dusty pastels to complete a soft and welcoming space,' suggests Kasia Wiktorowicz, marketing communications manager for paint company Valspar. If you want more tips on getting that Scandi look go and have a read of these cosy Scandinavian style bedrooms. And check out these stylish white bedroom design ideas, too. Right on trend, deep colours can be a really successful small bedroom design idea, making it feel warm and cosy when lit by bedside table lamps, elegant and smart by daylight. 'Be brave and go bold, even in small spaces, using deep and moody shades. Combine with light, bright accessories and lots of light for a striking room that’s completely on trend,' continues Kasia Wiktorowicz. Check out these gorgeous grey bedroom design ideas. We have loads more advice on choosing the perfect paint for bedrooms over on our guide, so go and have a read before you make an bold decisions. A very effective (and underrated) way to add interest to a small bedroom design is to experiment with wallpaper. Choosing a design with a subtle, receding pattern that will create dimension and texture is a subtler approach than picking out a wallpaper with a bold pattern or a large repeat that visually advances – thereby making the room feel smaller. Perhaps the most effective solution to decluttering a small bedroom is to choose a bed with built-in storage. After all, the space under the bed is not doing anything, so why not get it to work? Take a look at storage headboards, too. They're a clever way to stash clutter and display your favourite items, too. Find more small bedroom design ideas in our dedicated gallery. A bed with handy drawers, such as the Ikea Hemnes day-bed frame (pictured below), will accommodate everything from duvets and bedding to clothing and shoes. If you don’t want to see the bed at all during the day, consider a foldable futon – or an even more radical solution, the completely foldable Bed in a Box from Sofa.com. Which works best for a small bedroom – an open storage unit with a clothes rail, or a traditional wardrobe, albeit a small one? Well, that depends largely on what kind of a look you want to create in your bedroom. For a relaxed feel, opt for an open storage system, such as the Ikea Elvarli unit(below), which comes in several sizes and configurations and is customisable to the proportions of your room. An exposed clothing rail does not have to mean that your bedroom will be untidy – mix it up with nice jewellery and hats, and you’ve got yourself a boudoir! But, if having your clothes on display just isn’t your thing, save space by choosing wardrobes with sliding doors (which don't have to be opened outwards), and go for a white or mirrored finish to make your space will feel larger still. There are plenty of slimline wardrobes out there, too: we really like the very skinny Laura Ashley Ashwell Clothes Storage Unit, which has the added benefit of a full-length mirror, or the equally unobtrusive Sonoma Single Wardrobe from Marks & Spencer. Check out more handy clothes storage ideas in our dedicated feature. A small bedroom design with a desk is not a contradiction in terms. If you like the tranquility of your bedroom for getting some work done, or if you are flat-sharing, then thinking about fitting in a compact desk makes sense. It’s even better if the desk can double up as a dressing table, so that you don’t end up overloading a small space with too many furniture pieces. The Oak Ladder Desk from the Futon Company can easily perform both functions, while the Oak Mini Dresser, with a pretty mirror in the middle, is a more feminine option that can still fit a laptop when needed. The extra shelving helps, too! Another appealing option is the Salina dressing table from Ercol (shown below); it comes with a generously sized mirror, which may well replace the need for any other mirror in a small bedroom. For our pick of the best dressing tables, go and have a read of our buying guide, you will easily find something to suit your style and budget. Choosing the right armchair for a small bedroom can be tricky; too small, and any daily activities such as making up become uncomfortable; too large, and there will hardly be room for anything else. The way to go is to choose a statement stool – small in size, but big on comfort and personality. Our pick of the bunch are the playfully fluffy Vilma Faux Fur Stool (pictured below) and the plump and elegant Victoria Linen and Wool Sofa Stool in Ecru, both from Maisons du Monde. Alternatively, you can still enjoy the enveloping comfort of a bigger chair, if the rest of the bedroom furniture is kept to a minimum. We've rounded up some of our fave bedroom chairs for every budget over on our buying guide. Small bedroom design ideas to add character? A small space has its advantages; one of them is being able to really zoom in on accents and detail that could be lost in a bigger room. Elaborately patterned textiles and floral arrangements can add personality and even a touch of exoticism to a small bedroom. You can also accent your small bedroom space with mirrors – and they don’t necessarily have to be large. Even a small mirror can create an illusion of a larger space. Think something that comes in a well designed frame and draws attention to itself. Some bedrooms are so small that there is not much room for anything other than the bed itself. This is where good quality bedlinen and bedspread come into their own, creating a cosy and inviting space. Crisp, white cotton bedlinen with a high thread count is guaranteed to refresh the look and feel of a small room and will reflect light. For even more oomph, why not try linen bedsheets? They will add a distressed, lived-in texture to your bed, and a touch of Bohemian chic to the overall look of your bedroom. What is even better is the range of colours to choose from; we especially like the chic Parisian Blue from the Linen Works (below). Check out more beautiful bedding in our pick of the best bedlinen. Looking for small bedroom design ideas to make the room feel taller? If you've got a small bedroom with a low ceiling (the two often go together), painting the lower half of the wall with a darker shade than that above dado height will make the room seem taller. Add to that vertical panels or subtle vertical stripes and the effect will be exaggerated. A window seat is a great addition to a small bedroom design. It can allow you to introduce seating where there might otherwise not be space, plus it can be built with hidden storage beneath a lift-up lid.